CHALLENGE: Develop a unique government contractor marketing kit that could house many promotional materials including an eight-page corporate brochure, letterhead, product sales sheet inserts, and business cards. 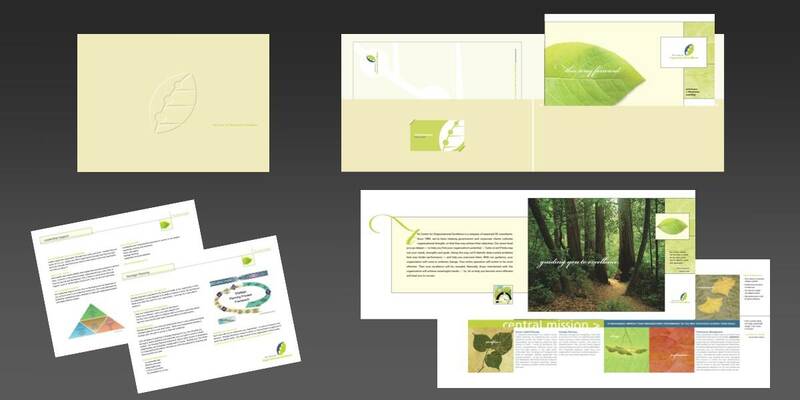 SOLUTION: We branded COE with an organic, nature theme to convey how the company can nurture, grow, and evolve clients’ business processes. We extended our logo design into this custom government contractor marketing kit. We incorporated beautiful nature photography. And each product or service was represented by a unique leaf found in nature. RESULTS: The brand was well received by clients and prospects as well as patrons at the Excellence in Government (EIG) Conference in DC. Since launching the brand COE has grown and revenue has increased. EXECUTION: “This way forward” continues to establish COE as a leader, a helpful guide, and a firm that offers better solutions and outcomes for Federal agencies. The experience of working with this client was invaluable for branding government contracting firms in the future.